If you think that you don’t need to focus on General Awareness as long as you are strong in Reasoning and Quants, you are wrong! General Awareness is the best scoring section in the SSC CGL Tier 1 exam; you can get maximum marks for the time invested in answering the questions. Time Saver: Since General Awareness section does not involve calculations or rules, you can solve questions based on this section quickly. Even if you prepare some of the topics from this section, you can easily score 20 marks. Low Chances of Getting Negative Marks: As you do not have to solve General Awareness questions, you will always know whether you know the answer or not. This means there is a lower chance that you will knowingly mark an answer wrong. Recognize the question pattern: SSC CGL has a typical style of question patterns, especially the questions asked from the static GK. You should attempt previous year question papers to know the pattern and practice accordingly. Cover the syllabus: Most of the questions in SSC CGL are from Indian History, Science, Geography, India Polity, and Current Affairs such as important dates, event people and places in the news. We have created a simplified method that will ensure you recall almost perfectly. It utilizes the Ebbinghaus Forgetting Formula, and you can read more about it here. Current Affairs: The best method to prepare for current affairs is by reading a newspaper daily (Recent happenings - national & international importance). However, this is not feasible for many students, given time constraints. We at ExamVictor provide monthly Current Affairs summaries to our students as part of our course. These give you the ability to quickly absorb the major developments each month, categorized under headings such as Politics, Economics, Sports, Environment and many others. Practice Tests and solved papers: General Awareness questions do not require practice for managing your time but, the practice definitely helps in you studying the required material. Previous year solved papers will also help you. 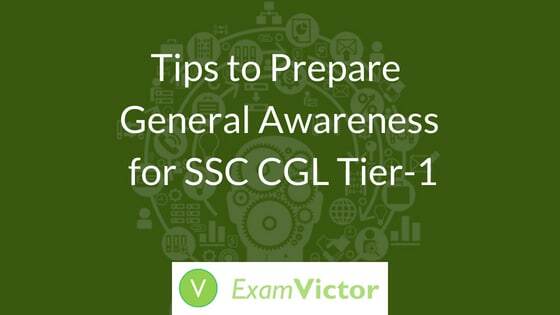 What not to do while preparing General Awareness for SSC CGL Tier 1? While preparing for General Awareness, the common tendency of students is to focus on the Current Affairs section as this is the general requirement in banking and other recruitment exams. 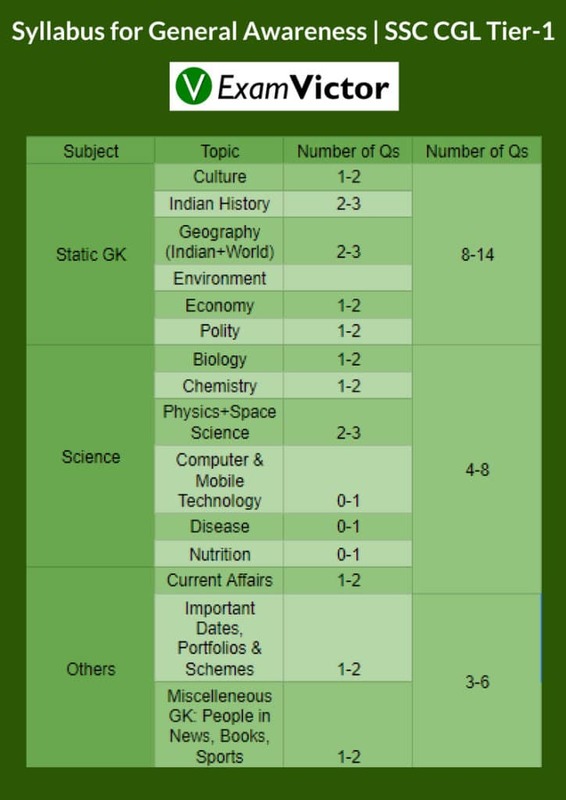 From the trend of SSC CGL General Awareness section, as given above, you will notice that the weightage of Static General Knowledge is comparatively higher. So, you need to go about preparing for this section smartly. You need to look at how the paper setters have been leaning because otherwise preparing for this section can get to be a tough and never-ending task. Although, it is also not wise to say ignore Current Affairs completely, do not invest too much time in them. History: You may start by reading NCERT textbooks of class 11 and 12. Once again, Lucent’s General Knowledge book is also good for this section. Questions on Culture can also be easily solved by reading Lucent’s General Knowledge books. Geography: NCERT Textbooks for Social Science Class 7 to 10 and for Geography Class 11, 12. Science: NCERT textbooks of Science from class 6 to 10 are the best source. Polity: The most important book on this topic is Indian Polity by M. Laxmikanth. You can also attempt to solve questions in NIOS study material and Lucent books. Economics: Mostly straightforward questions are asked. e.g. Definition and concepts of Economy. NCERT’s Economy book of Class 11 (India’s Economy & Development) is a good read for a basic idea of Indian Economy. Miscellaneous: Lucent’s General Knowledge book is more than sufficient to tackle the miscellaneous topics. So, the General Awareness section of SSC CGL Exam can be very scoring if you tackle it wisely. In this blog post, we have tried to provide you with the best strategy for General Awareness of Tier-1 through descriptive tables and diagram. ExamVictor's SSC CGL Online Course has detailed video lectures along with the best material culled from various sources. If you are looking for a superlative self-study experience, click on the link below to find out more about our course. Looking for SSC CGL Exam Coaching? You have come to the right place! We offer comprehensive online coaching for SSC CGL. We also offer comprehensive study material for these exams which you can access online or get at your doorstep through speed post.